This very peculiar creature of the Strandbeest species (Dutch: strand=beach + beest=beast) strolls around on Dutch beaches. I am not sure exactly where as it moves independently. It is fed by the wind, it feels where the sea starts and then moves away. It is made from plastic bags, tie strips and from those yellow blowpipes, through which kids like to blow paper arrows. No idea what they are really meant for – besides of course for making Strandbeest. Jansen expresses in a very literal way what it is to be the ‘image of God’. Most tangibly we are small creators when we get children. But also a book that I am working on I sometimes call a ‘delivery’ or ‘baby’. By acting and speaking we create new realities all day long anyhow that go on to lead their own lives. Sometimes I said something years ago that may have grown into a monster – and sometimes it is given back to me as well. My own ‘creation’ turns itself against me as ‘creator’. Recently my dear wife gave me a strandbeest do-it-yourself kit. An hour later, I had indeed experienced the ‘disappointments’ and ‘problems’, at least a little, that Jansen talks about. The thing fell apart five times and some of these times I had the urge to smash it against the wall. In this way the building effort turned into a real meditation. 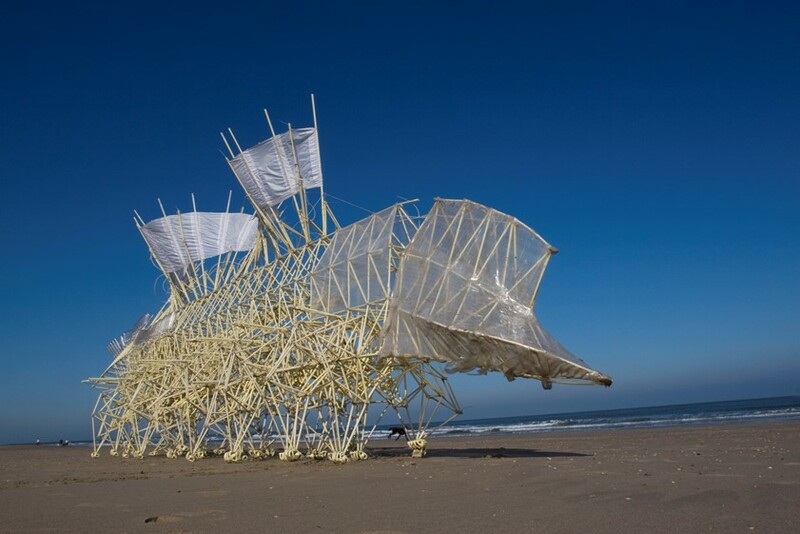 Theo Jansen: Strandbeest, in 2009 moving around on the beach near Bergen aan Zee, The Netherlands. Theo Jansen (Den Haag, 1948) is a Dutch artist. Jansen grew up with a knack for both physics and art and studied physics at the University of Delft. While at Delft, Jansen was involved in many projects that involved both art and technology, including a paint machine and a UFO. In 1990, he began what he is known for today: building large mechanisms out of PVC that are able to move on their own, known only as Strandbeest. His animated works are a fusion of art and engineering. Jansen says: "The walls between art and engineering exist only in our minds." What was at first a rudimentary breed has slowly evolved into a generation of machines that are able to react to their environment: "Over time, these skeletons have become increasingly better at surviving the elements such as storms and water, and eventually I want to put these animals out in herds on the beaches, so they will live their own lives." In 2014 the photo book Strandbeest: The Dream Machines of Theo Jansen came out by the Russian-American photographer Lena Herzog, who followed Jansen for seven years. Reinier Sonneveld (b. 1978) makes his living by writing theological books. He was the youngest writer in the Netherlands to receive the Prize for the Best Christian Book and he has sold a quarter of a million copies. He is also the chairman of the board of ArtWay.